Natural Chinese herbal patches that are proven to dramatically accelerate the healing of acute injuries. FASTT Patch may significantly decrease post-surgery recovery time. 3-6 patches are usually recommended for most injuries. Contact us for an individual advice. The injured area should be covered with herbs. 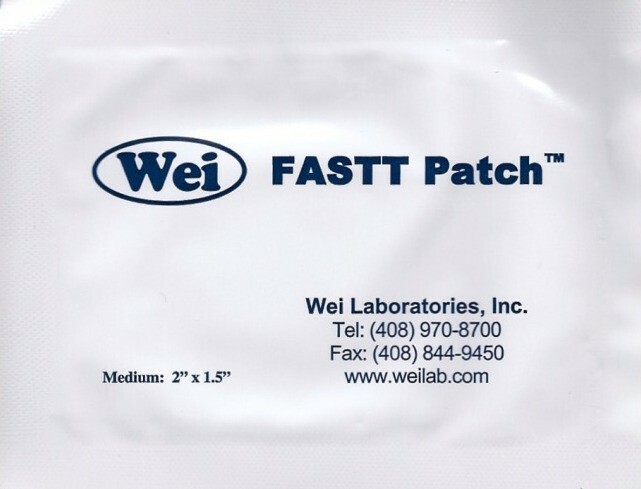 Small FASTT Patch (1.0 inch x 0.75 inch) – neutraceutical area 0.75" x 1"
Medium FASTT Patch (2.0 inch x 1.5 inch) – neutraceutical area 1.5" x 2"
Large FASTT Patch (3.5 inch x 3.0 inch) – neutraceutical area 3" x 3.5"
Peel off the paper cover. Apply the patch to the injured area with the herbs in direct contact with clean, dry skin (shaved where necessary). Patches are worn continuously for 48-hours (2 days). Remove the patch to give the skin a 24-hour (1 day) break before applying a new one to avoid skin irritations. The tape is water proof so patients can shower or swim while wearing the patch. 1. After removal of the patch, if there is residual herbal paste left on the skin, apply some vegetable oil or any other oil, wait for 1 minute and then wipe it off using tissues. 2. If it is difficult to remove the tape from skin, especially in post-surgical case, please use soap to wash it off. 3. The FASTT Patch is a latex-free product and the tape However, after prolonged use, local skin rashes may developed in the treatment area. If rashes occur, remove the patch and apply Antihistamine ointment to cope with itching and avoid scratching with fingers. If the patient happens to scratch the rash and break the skin, apply antibiotic ointment to prevent any bacteria infection. If patient is sensitive to the supporting tape, cut off the surrounding tape and wrap the patch with an elastic bandage. 1. It is important to cover the injured area with herbs. The injured area without herb coverage may not be helped. 2. Avoid using ice in the injured area. Heat pad will be helped. 3. Avoid using FASTT Patch on damaged skin including scuff, scrape and scabs. 4. Pregnant women should not use the FASTT Patch. 5. 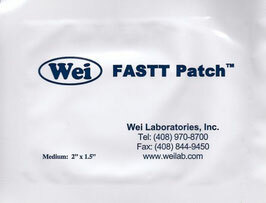 People with super sensitive skin should avoid using the FASTT Patch. If patients get swelling lymph nodes after using the FASTT Patch, it may due to the allergic reactions to the herbal ingredient and should stop using the FASTT Patch immediately. 6. There is no known contraindication to current medications. Wei Laboratories, Inc. is engaged in research, development, manufacturing and commercialization of herb-based healthcare products for unmet medical needs. All of the company's products are made in the USA under the strictest process control and quality assurance conditions. Wei products' ingredients meet the highest quality and consistency standards ensuring high quality patches every time. Wei Laboratories was founded by Dr. Jeffrey Wei and Dr. Sarah Li. They are both biochemists with post Doctoral work at Harvard Medical School. They are committed to research and helping patients heal with natural healthcare. Wei Laboratories is based in Santa Clara, California. Wei Laboratories website.